Hey guys! Today I am super stoked to be bringing you guys another fabulous #GIVEAWAY! Today I am giving away an #IFITACTIVE thanks to IFIT! I will list the giveaway entry rules below it will run from today until Sunday evening! I am also wearing Albion Fit in this post. The ifit active is perfect for anyone. I love it because I am not really a workout person but it tracks my walking and everything, especially being a nanny I am running around all day but never really kept track of my movement or anything! 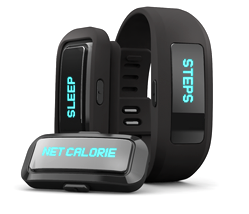 It also keeps tracks of your calories and what you eat, sleep, distances, etc. The coolest part is that it also sends you messages to keep you in your daily or weekly goals! Its perfect for anyone and super easy to work with. You just download the app and it automatically syncs with your iPhone, android, &iPod touch! Hope you like! Keep tabs on your daily movement and activity. The more you move, the more calories you burn. It's that simple. Set activity goals for your steps, distance, and calories burned. By setting specific goals, you have something to work for every day. iFit will alert you of your progress, when you achieve your goals, and when you hit a personal best. You'll constantly feel motivated to push harder and do better. MUST BE FOLLOWING IFIT ON INSTAGRAM here! MUST BE FOLLOWiNG THEBLONDELATTE ON INSTAGRAM HERE! MUST LIKE THE GIVEAWAY PHOTO ON INSTAGRAM:here! BONUS ENTRIES:(optional) FOLLOW THE BLONDE LATTE ON FACEBOOK: HERE! BONUS ENTRIES:(optional) IF YOU TAG UP TO TWO PEOPLE ON INSTAGRAM ON THE GIVEAWAY POST! COMMENT ON INSTAGRAM WHEN COMPLETED! IFIT ACTIVE:Shop.ifit.com- Exact one as in Giveaway! You look amazing. Love the workout attire and fantastic giveaway! Entered on instagram. Thank you for the sweet compliments & for entering! !